Thoughtfulness. When “making” photos, be thoughtful and mindful. Notice how I did not say “taking.” We make photos: we see the shot, frame it, and then “make” the picture. If it’s worth sharing, it’s worth printing. If you share this picture with the world, it’s probably a keeper. Friends, I’m behind. My pictures sit in a cyber waiting room, neglected, forgotten…unconnected. But I did do this….once. A page out my son’s baby book. 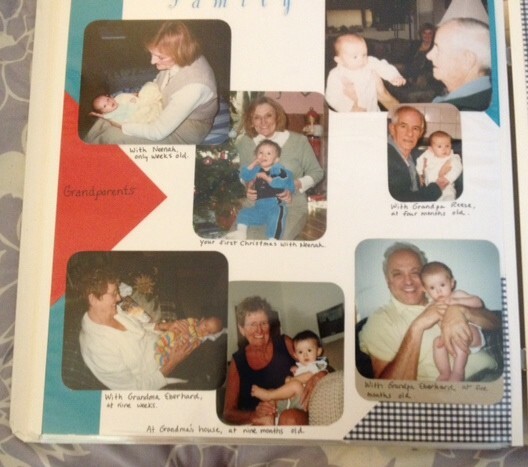 Here I have all the grandparents on one page. A proud moment. I was so ambitious. She went on to say that we when we look at a photo from the past, we experience the moment by looking at a shirt, remembering that color of shirt, that place where you wore it, what you thought about at that moment. You re-experience the moment by activating those connections. My husband will easily snap thirty or more pictures of a “moment.” Often, I don’t even know when he’s taking the picture and you can tell. I’m in mid-sentence, in motion, not looking at the camera, slobbering, whatever. It’s a picture worthy of the trash bin. As my kids have trouble sitting for more than two seconds, and I, personally, feel compelled to not miss a thing, we have gotten into this habit of overtaking. The best shot out of 65 photos! And, an example of my kids sitting still. The bonus: Flipping through all these pictures is like a stop-motion movie. Beyond photos, I began to wonder how else we are not connecting those neurons. In our more simple, analog days, I could recite phone numbers, remember designated channels of TV shows…I could spell words. I could pick up a paper and understand the power of a singular headline. I might savor a re-read of a letter I received in the mail. Now, I take in so many headlines, tweets, videos, images, and photos. In social media, many comments I type, I send off never to be read again. My brain has no method to reconnect with these experiences. With all this information at our fingertips, it seems somehow harder for our brain to access. Isn’t is ironic that in our quest to fill ourselves with so much information, we are diminished in our capacity to retain it? I no longer think it’s an early onset of Alzheimer’s. When my memory is slacking, it is my brain signaling that I am on overload, memory full, connection lost. It is perhaps a signal to take my head out of my screen to notice my surroundings. For example, observe the fake plant in the corner or realize I know the person standing next to me. And like “making” photos, I need to make my information more meaningful. It’s my summer project to commit my digital memories to paper, and hopefully connect those neurons and realize memories. I will focus on the keepers and maybe not make quite so many photos. There’s always the old-fashioned way. I can close my eyes and make a mental picture. Oh, I’m relieved, too! I feel dizzy with all the information yet I can’t seem to shut it down, either. Thanks for the comments! I’m right there with you. I live for the reward of a kind remark or something interesting, but also fear what I’m missing when I shut it down. It is definitely a conundrum. A conundrum! Yes, that’s the perfect way to describe it. Sometimes I think the only way to do is to go cold turkey for a short while. Of course, you must first make announcements that you’re leaving, right? Ha ha. Or better yet, create a social media countdown, for your departure. Yes, I do believe we are both obsessed. Nothing wrong with that. A countdown…then you definitely have to leave then. Ha! Good idea. You know those dramatic departures and then a week later, oh, we’re back! Thanks, Roy. Lately, I have been taking hundreds of pictures each day. (300-500) This article helped me figure out what to do after I take all of those wonderful pictures! Thanks so much for the reblog! I appreciate it. Yes! Yes! I’m with you on the photo thing. I have so many digital photos, and they’re not organized which just stresses me out if I think about it. On the other hand, I rarely print photos anymore. I like the idea of making an automatic digital photo book after every so many pics. Of course, then I’d need to be more discretionary with the pics I take. I don’t need a picture of a funny sign I took for Facebook to show up in my photo album! Yes! Yes! I know. I feel overwhelmed all the time, which is why I have put it off. I think there is some kind of automatic thing you could do….or maybe just some kind of reminder would be good. I also take random photos that don’t really belong any in book! I’m with you. It’s the organizing that is so huge. I think of photos now in terms of events and even years. Yikes! Bird by bird. Very thoughtful Amy, and I’d say spot on. I am Instagramming a lot these days. I love the visual. And I have heard people talk about making mini albums. I do print some of my best kid pictures to enjoy around the house. But like Carrie, I am slightly overwhelmed by the quantity. It’ll only get worse. 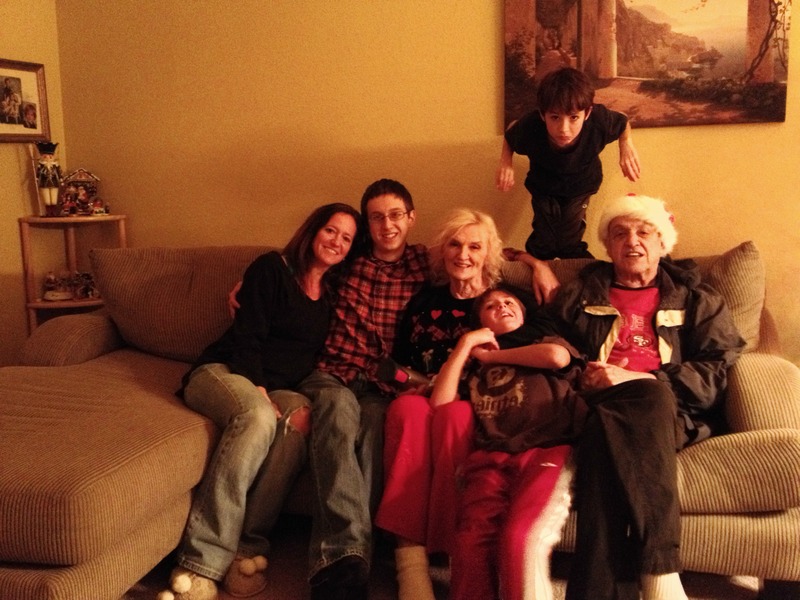 I love love love the family photo. Your kid looks like a vulture, the hole in your left pants leg, and the slippers.Truthfully, in reposting my pictures on my blog, I feel I reconnect with them. And as long as the blog is hot, it’ll always contain the pictures I slaved over. I was thinking hard about you today and about how I don’t always see pictures from you. So Espn, ya’ know? Hi, I really enjoyed reading your thoughtful blog. Quite a while ago I read an article that stated that a single average Sunday newspaper contains more information than a medival scholar would read in a lifetime. It does feel like we are hosed down with images and narrative. It gets difficult to hear the birds sing within the cacophony of noise at times. I can believe that about the Sunday newspaper, especially if you include all the ads! I think that there is just so much more to read and learn about. It’s definitely a part of it. That, and we are all sharing all the things we know. I think that’s a good thing. It’s just a matter of finding the balance and listening those birds once in awhile. Love this! It’s so true and I take so many photos yet rarely do anything with them. I have a current scrapbooking project that keeps being pushed aside. Now you have given me some more inspiration! Thanks! Oh good! So happy to hear that you’re inspired. I think a lot of times with photo projects it’s just a matter of getting started. Once I get going on one, I usually really enjoy it. Good luck with it, Daile! I would never want to go back to rolls of film. I remember that disappointment! Now the disappointment happens at a quicker rate. Ha ha! I like your idea of the photo journal on your blog. Even that would be tough to keep up. At least you have yours backed up. That will be my first step, Vanessa! Then, I’ll need my game plan. Do I do events together, years. Uh oh, I’m feeling overwhelmed. I think I’ll go take some pictures now. Really, that’s what I usually do! My son is going into middle school next year, so that’s given me a little push to get a move on with this! And the overload is impossible to avoid. Ah, those were the days. You had 12 shots on a roll (or, if you were feeling flush with cash, 36) and you had to make each one count. Then, off to the drugstore or the photo booth in the middle of the mall parking lot and then the long wait. Now we have instant gratification. Is it better? YES! I constantly pour over my old photos in my iPhone. But we don’t have printed pics anymore. My wife had albums full of photos from her youth. I wonder what my kids will have to look at? I totally agree, Mark! Yes, I remember having to decide between 12 or 36 pictures. I much prefer the limitless, instant option. I review some pictures soon after t take them, but once I get them off my phone, to make room for more pictures of course, I soon forget about them. I’ve considered the digital album, but think those are still somehow not as intimate as the printed ones. Still, how many photo albums can one really have? I can just see it when my son brings home a girlfriend and I say here are 70 albums you can look at? Right. Or even 40 or 30! How many do you need?! Exactly though. I am doing this for my kids, too! Someday, they may want to look at photos. A classic case of more not always being better. When we had less photo options, we were more discriminating. More careful about what we chose to record. With digital photography it’s like the wild west. Shoot first, hundreds of times, and worry about quality much, much later. If at all. Exactly, Mark! Well said. Lately I’ve been thinking, “No, I don’t need to take a picture.” Ha ha. If an archeologist dug up my house 1,000 years from now he/she would think my family died about ten years ago because I think that is the last time I printed out a picture for our photo album. Thanks for the post. Oh, I’m not the only one! Well, somehow this makes me feel better. It’s never too late to print those photos. I want to take care of it before I lose them somehow. My first step will be to back them up. I’ve started it, but it’s very haphazard so I don’t even know what I’ve done. So confusing! I hope you can find a way to get a start on it. You can always make albums in Snapfish and just hold them there! So, you don’t have to print them all at once. You can just a little at a time too, and keep it on file as one of your projects. Thanks for stopping by! I often worry that my brain is declining as I have more and more trouble remembering things, but maybe as you say it’s just too full of stuff with today’s information overload. Phew! Ha ha. Yeah, I bet those are interesting arguments. Are you constantly changing your story and your facts? That could make an interesting short story. I like that idea! Thanks. Now, if I can remember that I thought of it, with your help of course. Thanks, TD. Ha! No. My argument was always…I DON’T REMEMBER THAT!! Great post, Amy. Since I’ve gotten more serious about photography, I have committed to keeping my photos more organized. And you’re right, it really does help to spark memories to actually look at those photos. I use Adobe Lightroom and I love the fact that I can catalog my shots so I can easily find them and I think it’s a tool that even people who don’t shoot seriously might enjoy. It has great, but easy editing tools and makes it so much simpler to keep track of all those photos. It even has a function for assembling photos into books, although I haven’t tried that yet. The other thing I do, even when taking snapshots is to go through the camera and delete the bad ones asap. Then storing and editing doesn’t seem so overwhelming. I realize that your post is a much bigger-picture issue of keeping track in the digital age, but it reminded me of how, before I started filing my photos, I actually wasn’t taking (or making) very many because I didn’t have a clue where to put them so I’d look at them from time-to-time! Thanks, Cathy! I like your idea of deleting bad photos ASAP! I try to do that sometimes. That’s a good practice. At some point, I know I will be deleting quite a few. Your comments made me realize it’s about having some kind of system to manage and organize photos. I think when I get out from under the huge task of saving them and working with the backlog, I will attempt a more orderly system. Your Adobe Lightroom sounds ideal. I like that it has the function of assembling photos. I love all your wonderful photos! Thanks for sharing your thoughts. congratulationa on the 2 years Amy. The thing that strikes me more and more is how little of my life has been photographed. There cannot be more than a dozen photos of me knocking about when i was in my childhood. Just the way things were! Thanks, Jim! I’m still alive and kicking somehow. It’s true for me too that my younger self wasn’t photographed so much. We had a few albums and one big family photo we did at the church. Certainly, people didn’t take photos the way they do now. It’s funny to think with all this photo taking, they still might not see them if they are lost among thousands of photos on a hard drive. Now it could be too much of a good thing. I agree Amy – my childhood photos are the group ones with my mum and dad and brother and sisters squinting into the sun (remember we had to have the sun behind the camera!) but because they are so rare they are that more important to me. Selfie? Don’t understand the misplaced narcissism of them! Getting old and grumpy! Totally agree. I’m selfied out! But have you heard of dronies? This is when your drone can take pictures of you! No kidding. If I had a drone the last thing I would do is have it take pictures of me. I know, right?! I read this could be the latest craze. You take a drone on vacation with you and it records everything for you. Pictures, videos, dronies, etc. Ha ha. I wonder if it will fly. Ha ha. I’m betting others will! First, congrats on your 2nd blogo-versary! That’s HUGE! I’m already thinking about my one year and that’s in OCTOBER! Ha! As for the photos, this was so great to read. Sometimes at night, before I go to bed, I sit and go through the photos in my phone from the day or week. I’ve even been known to look at my whole 1000 icloud available on my mini ipad while running on the treadmill. And it felt a bit embarrassing. I mean, how much of my kids can I get?! But it does help me remember, and these days are whizzing by so very, very fast. Sometimes if I’m attempting to quiet the kids down during a quick meal without Mom and Dad sitting right there, I’ll even set the computer on slideshow and let them ooo and ah at themselves. They love it. Thank you for the reminder to make and ORDER those Snapfish books and most of all, to remember. Thank you, Jen! I appreciate that. The time has gone by quickly! And, I feel like my blog has changed over time and my writing has grown. It feels like an accomplishment! Yay! Oh, I think that’s cool that your kids can look a slideshow with their photos. That counts as review. And you looking through your icloud, too! You have so many beautiful shots. Mine seem so haphazard, I feel it might stress me out too much. I know that feeling of how much more do I need? And then, in a blink of an eye, my child is in middle school and I think I did a good thing! One day, I hope my kids will appreciate it. This is for them as much as it is for me. You sound like you’re doing great with it. Keep up the good work! Great post, Amy, with its finger on the zeitgeist. So, what happens to the actual ‘moment’ when we are so busy recording it? Sometimes I leave my camera at home. I love your comments, Brenda. Thank you. Exactly, well said. In our efforts to record the “moment,” we often don’t experience it, or experience it fully, or in just a different way altogether. I think being preoccupied with recording it usually takes away! Good for you to leave your camera at home. We should have a leave your camera at home day! That’s a really good observation, Amy. I seem to have less connection with things I read too, just because of volume. I also find that I forget things easier these days, as I’m busier, and I seem not to get enough sleep most of the time. Some days I wake up groggy just knowing it’s going to be a tough day to remember stuff. Thanks so much, Trent! I’m sure there’s all kinds of research out there about this, but I’m too overloaded to even look for it! Where will it end? How many things can we store? You are a busy bee these days. Thanks for taking time to stop by here. I hope you can get a nap in today! I hope you’re taking care of yourself. It’s like you are in my head sometimes. “I, personally, feel compelled to not miss a thing” describes me to a T. Every day I play little games with myself to try to limit the time I spend filling up my brain with information from the internet. I think I will skip a post or a link or a message…just read this but, not the comments…if I didn’t read it the day it came in then hit delete. That never happens. What if I miss something? There is no way to keep up and remember everything. Not in this brain. Oh Michelle! I am in your head. Yes, I am… Ok, I’m not but I’m sure it would be fun! Can I just tell you how happy I am that you come to read my posts. I notice and I look forward to you coming! Truly. So, for what it’s worth, I hope that helps your brain. I appreciate all that your brain does and that you share my sentiment. We just do the best we can, because there’s only going to be more coming. I love that you said that! So sweet, Michelle! Well, I’ll gladly do my part to help your brain function. It’s an honor. So you are going from paper to digital, the other way around! What will you be doing with them in the digital format? In any case, reviewing them will be a trip down memory lane. And connect neurons. 🙂 I hope it’s satisfying and rewarding. You can’t put a price on memories. Mainly saving some for posterity … after all, less space than the actual albums. Who knows … maybe I will get some posts out of them as well. wow i can remember the old days. Not so long ago, huh? Thanks. My friend who is a photographer has recommended printing out, as you are going to, the best ones – and ruthlessly discarding the rest. And putting them in good old fashioned photo albums, for people to actually look at and enjoy. You look fantastic in that picture of your family! Are all those kids yours? So far my project is not going well. But I am determined this time, Samara. I’m glad to hear my advice is consistent with the professional. You never know what social media will look like 30 or 40 years from now. I am sure it will change. It can’t hurt to have a hard copy version. I think it’s also about the collection you put together. Thanks! What a sweet thing to say. The two younger boys are my sons and my nephew is also in the picture. 🙂 Thanks so much for the visit! I’m a giant mess…. But I do love to look at my piles of photos. Thoughtful points, Amy. Oh good, Audra. You’re revisiting your photos! That’s more than I do.